This blog originally appeared at EdTechTeacher. Technology integration can be difficult. Often times when schools go one-to-one with iPads, teachers continue to do what they’ve always done. Digital worksheets, PDFs with annotations, and consumption can quickly become the norm. I remember when I went one-to-one with devices in my secondary English classrooms. I immediately wanted to figure out how my classes could go paperless and how I could get my students to do everything on their devices. However, I was only at the “enhancement” level of Dr. Ruben Puentedura’s SAMR technology integration framework as I was only using technology to substitute or augment student classroom activities. For example, I had students take notes on their devices instead as taking notes with pencil and paper. 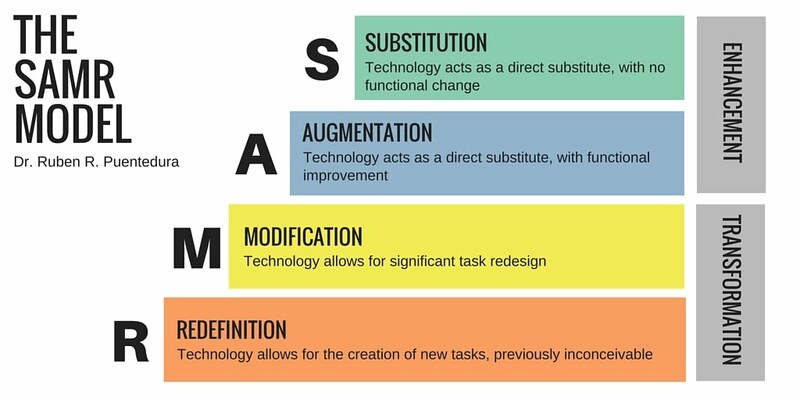 What I needed to strive for was the “transformation” area of SAMR, modification and redefinition. I needed to help my students be creators of content and not simply consumers of content. Research has shown that when students create meaningful products that require synthesis of information consumed and resources curated, they learn and remember more than when they simply consume content. It’s not that using technology iPads as a substitute for pen and paper is “bad.” However, teachers can do much more to transform their teaching and student learning. When iPads are added to the pedagogical equation, the recipe for curriculum, instruction, and assessment changes. What tasks can students now undertake that were previously inconceivable without the technology? iPads are not only useful for the consumption of new material and for curating resources, but these mobile devices provide a pathway to the pinnacle of student creation. With two cameras (front-facing and back-facing), a microphone, and innumerable applications for capturing and editing media, iPads allow students to show what they know, think, feel, and understand in new and different ways. Moreover, after students create these new products they have the ability to share them with a wide audience. Safari is the iPad’s native web browser and is optimized for performance, workflow, and functionality. Students can search, save, and create shortcuts to websites for easier access to information. Chrome may be ideal for students in schools using the G Suite for Education. When students learn to leverage the Chrome web browser, they can use the Google voice search and gain a more seamless integration with other G Suite for Education applications. Additionally, English as a second language students will enjoy the ease of translating webpages into their native language. Sway is one of the newest members of Microsoft Office. Teachers can share beautifully designed digital flyers, newsletters, and presentations with its adaptive design. Then Sways can be shared with a link to whatever learning management system the teacher prefers, including Microsoft Teams, a digital hub for teachers and students, in Office 365 for Education. Google Keep is the newest member of the G Suite for Education. Students can easily create digital sticky notes containing audio, photos, checkboxes and so much more. They can also organize their notes through labels and color-coding. Keep is a good option for setting up reminders, creating list, and curating resources for class. Apple’s native notes application contains useful features teachers and students can leverage to maximize student success, including the ability to add tables, scan documents, sketch and more. Notes on the iPad is a good option for non-G Suite for Education schools. OneNote gets curation and organization right. It allows students to organize multiple notebooks, with multiple sections, and multiple pages within each. In addition to many of the features of the other curation applications, OneNote also includes an equation editor, the ability to convert hand-drawn shapes into perfect polygons and circles, and different paper styles including ruled lines and grid lines. For Office 365 schools, OneNote is definitely great for curation. Clips by Apple allows students to create short videos with fun and engaging text, effects, and graphics. It allows students to show what they know and understand in a completely different way and redefines what assessment can look like in the classroom. With Chatterpix, students can bring anything to “life” and make it talk, including inanimate objects, animals, and hand-drawn art. By simply taking or uploading their image into the app, drawing a line where they would like the mouth to be, and recording their voice, students can show what they think and feel creatively. One of the best applications for making, editing, and sharing movies is Apple’s iMovie for iPad. Students and start from scratch or use one of iMovies many trailers to create high-quality movies with images, text, photos, videos, voice over, music, transitions and much more. iMovie makes any student feel like Spielberg, Cameron, or Bay in the classroom. As you take students on the journey from consumption to creation using iPads, think about how you can leverage each of these applications with students to transform teaching and learning. As you develop your own recipe for success with curriculum, instruction, and assessment using technology, think about how you can shift the learning environment, go from teacher-centered to student-centered, and go from consumption to creation.